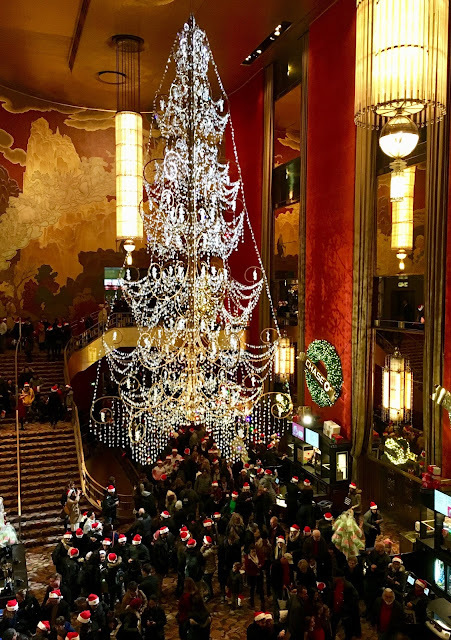 The Christmas tree chandelier in the lobby of the Radio City Music Hall, which opened to the public in December of 1932. They gave out Santa hats to everyone attending the Christmas Spectacular, hence the sea of red hats in most of the photos. We had great seats in the first mezzanine. We were going to buy seats closer, in the orchestra section but two employees said the view was better from the raised mezzanine area. It was. Ed took this photo, trying to capture the Rockettes were on stage. It was hard to get a good photo with our phones, but you can definitely see the lineup of all the girls. Here are 23 Facts about the Christmas Spectacular and the Rockettes. I've copied the text from here to make it easier to read. It's pretty interesting! 14. Our shoes are mic’d up. This is so the entire audience can hear us dance the “12 Days of Christmas” and “Rag Dolls” tap routines. Wardrobe removes the heel and sole, and inserts a custom leather sole that attaches to the bottom of the tap shoe. A new heel is made that allows a special cavity within the heel for the sound transmitter to be stored inside—this helps pick up the sounds of our taps (14,096 AA batteries are used throughout the run of the show!). 15. We can kick up to 1,200 times in one day. We do about 300 kicks per show and perform in up to four shows a day during busy periods! 18. Our wardrobe department does loads (and loads!) of laundry. Over 350 loads of laundry are done per week, for 16 hours per day during the week and 20 hours per day over the weekend. The cast’s shoes, laundry and costumes are stored in 180 laundry baskets backstage for each show. 22. More than 1,100 Stage Door Tours that are guided through Radio City Music Hall during the busy holiday season. 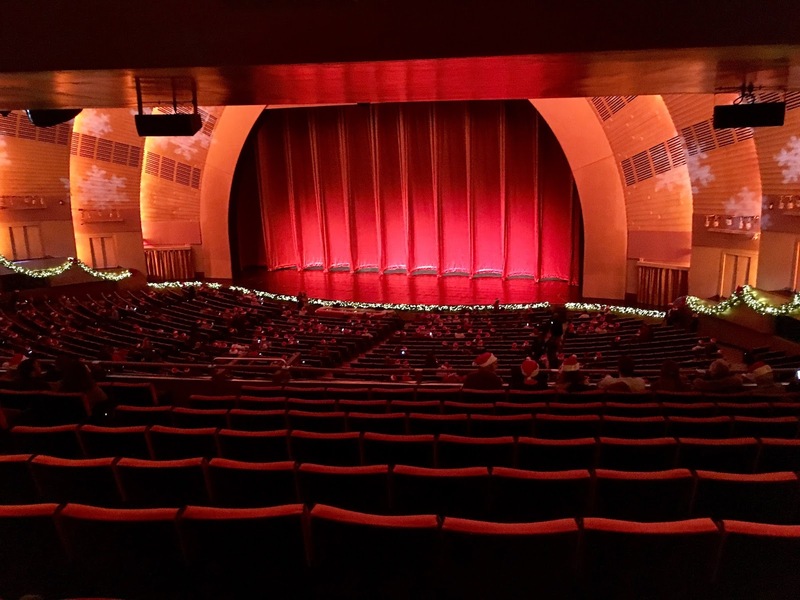 Approximately 23,000 people tour the Music Hall in November and December. This tour allows visitors to learn about the architectural history of the Hall, while experiencing the grandeur of the refurbished landmark. A sneak peek into the costume shop and the famous Roxy Suite (did you know this was Samuel “Roxy” Rothafel’s apartment?!) always proves to be a popular tourist draw.